Fan (shàn zǐ 扇子) is a must in summer. It can drive away summer heat and help bring cooling breeze. 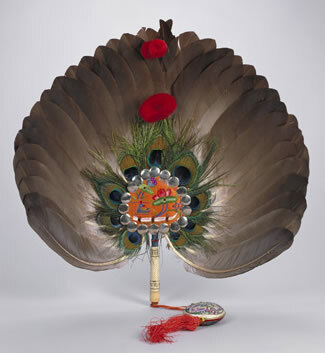 Since old ages, the Chinese fan has been carrying artistic and unique national style. China has always been regarded as “the kingdom of fans”. 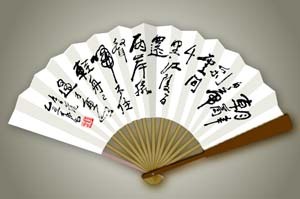 The fan first appeared in China about 3000 years ago, in the Shang (shāng 商) and Zhou (zhōu 周) dynasties. However, the fan in the early period was not used to help bring cooling breeze, but used as the symbol of etiquette. And it was called “the fan of honor”. After the Qin (qín 秦) and Han (hàn 汉) dynasties, the main shapes of fan are square, round and hexagon. The material that used to make fan are mainly silk. 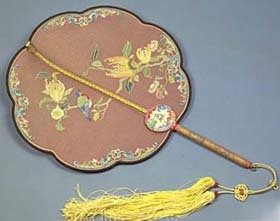 Because the silk fans were often used in royal court, people called them “court fan” (gōng shàn 宫扇). During the Tang (táng 唐) and Sui (suí 隋) dynasties, the prevailing fans are the round fan, feather fan, and some paper fans. 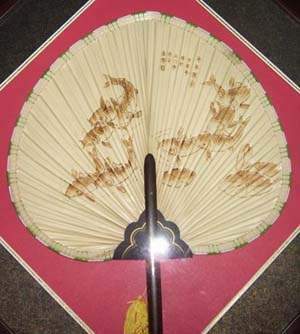 The folding fan gradually became popular after Song (sòng 宋) Dynasty. 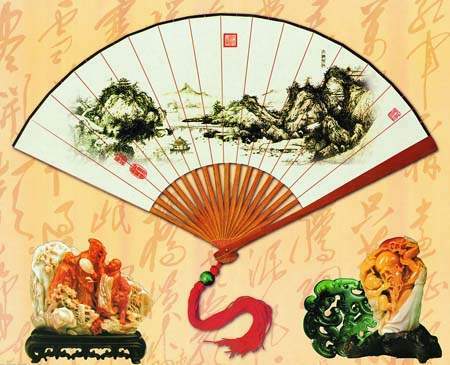 In Ming (míng 明) and Qing (qīng 清) dynasties, the home of folding fans are Zhejiang (zhè jiāng 浙江), Suzhou (sū zhōu 苏州) and Sichuan (sì chuān 四川), etc. Then writing poems and the vogue of drawing pictures on the cover of a fan is rising. Then this exquisite skill has been introduced to Europe, and became popular all over the world. 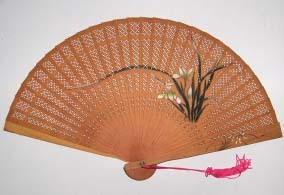 There are many kinds of Chinese fan, such as paper fan, silk fan, palm fan, feather fan, bamboo-knitted fan, etc. regarding the shapes of the fan, there are rectangular, round pentagonal, hexagonal and sunflower-shaped fans. However, the most famous fans are the sandalwood fan (tán xiāng shàn 檀香扇), the fire painting fan (huǒ huà shàn 火画扇), the bamboo-knitted fan (zhú sī shàn 竹丝扇)and the silk fan (ling juàn shàn 绫绢扇). The sandalwood fan is made by sandalwood, which has a natural fragrance. Even after many years, then sandalwood fan is also fragrant. It is very popular with people for its unique craft and style. The fire painting fan is first produced during the late period of Tongzhi (tóng zhì 同治) in Qing Dynasty. Then the technics of making the fire painting fan was developing. When making the fire painting fans, the workman combines two thin glass fans together and then painting on the fan with a tailor-made pen. The painting is comely, and will never fade. It is a competitive product to collect. The bamboo-knitted fan, usually called “gong fan”(龚扇), get the fame that as colorful as rosy clouds, and as thin as the wings of cicada. And it is always peach shaped. It is light yellow with delicate cover. It seems as a piece of brocade. With the handle made by ivory or ox bone, and decorated with pendant made from silk, the fan is with surpassing brilliancy. 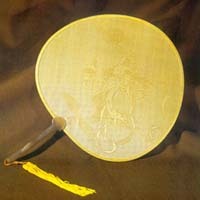 The silk is commonly used to make the cover of the round fan before the coming of folding fans. And nowadays, it is also used to make the cover of the folding fans. All the fans that with the cover of silk can be called silk fan. The person who holds the silk fan always appears gentle and cultivated.